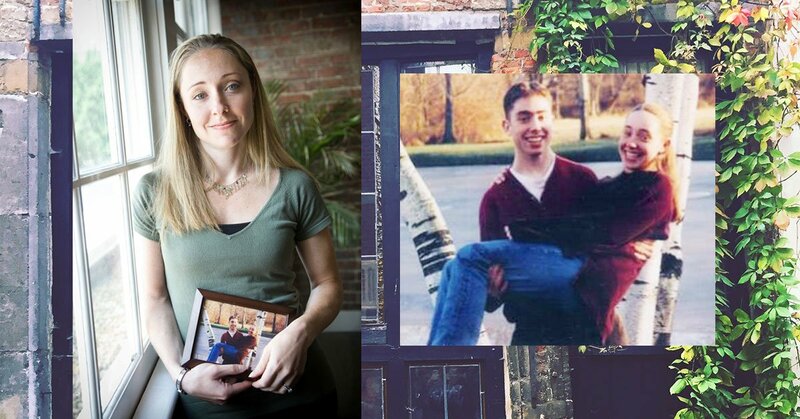 When Alison Malmon was a freshman at the University of Pennsylvania, her older brother, Brian, ended his life. Brian experienced depression and psychosis for three years when he was a student at Columbia University, but concealed his symptoms from everyone around him. As Alison grieved the loss of her brother, she became aware that there was a lack of places on college campuses where students felt comfortable talking to each other about mental health and suicide. So she created her own space for such a dialogue. Alison founded Active Minds in 2003 (then known as Open Minds) at the University of Pennsylvania. 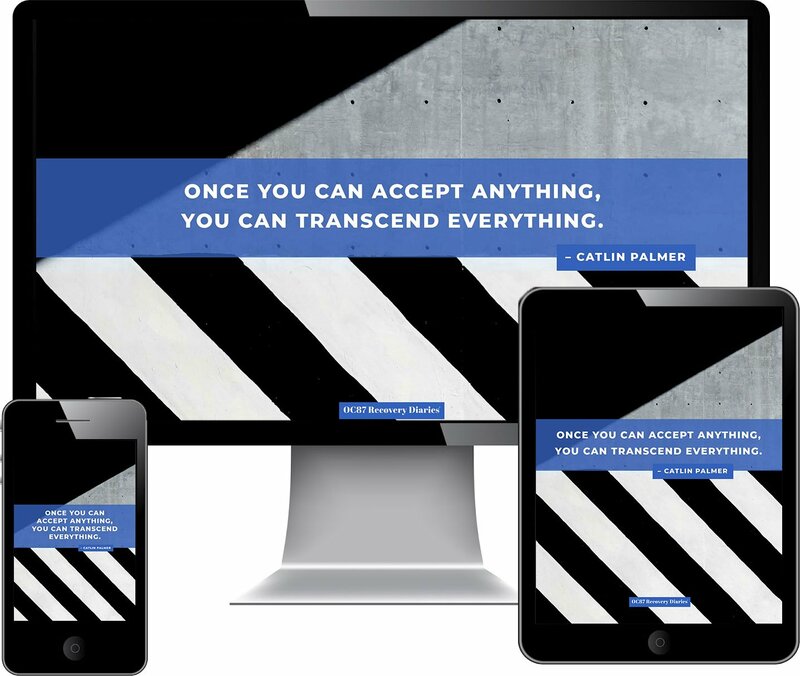 Today, Active Minds is changing the conversation about mental health in a big way. It supports a network of over 400 campus-based chapters across the United States and Canada that are made up of students passionate about mental health advocacy and education. 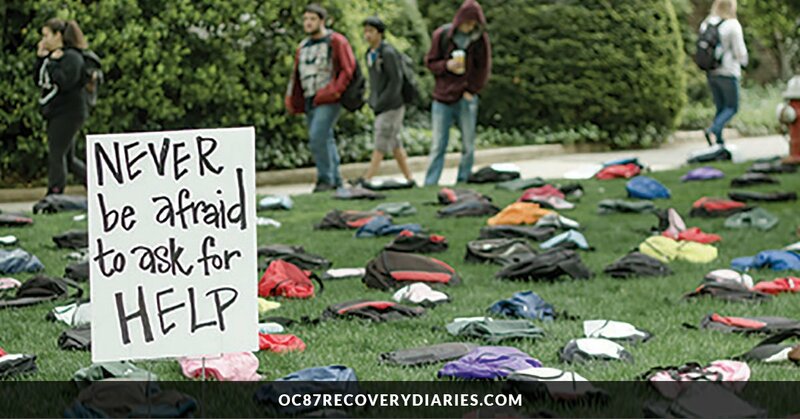 Among their many national efforts, Active Minds is well known for their suicide prevention exhibit called Send Silence Packing, which is an exhibit of 1,100 backpacks that represent 1,100 college students that die by suicide every year. The backpacks have all been donated to Active Minds, many of them with the stories and pictures of individuals who have died by suicide. 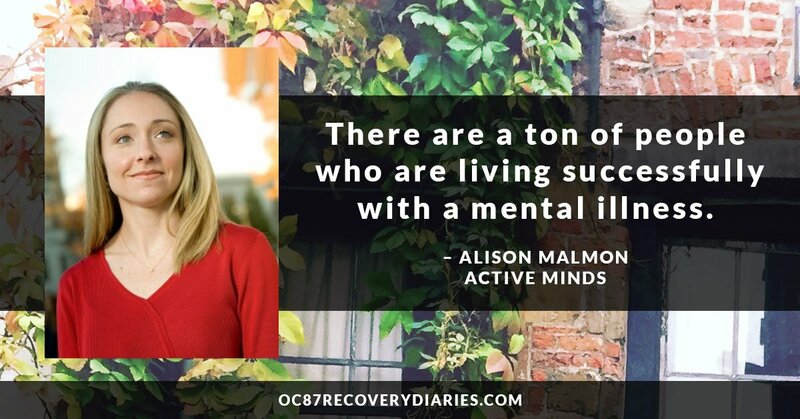 Alison is Executive Director of Active Minds. Here’s our conversation about her journey to date that has largely been inspired by her brother, Brian. GLENN HOLSTEN: I would love to know a little bit more about Brian. What are your fondest, strongest memories of him? ALISON MALMON: Gosh, I could go on forever. Brian was four years older than me. Exactly four years and four days older than me. We had such an interesting relationship because we were complete opposites, but so similar. We looked very much alike, similar personalities, but Brian was really strong and talented in the areas where I was weak, and vice versa. We fought — as siblings do — but we never really competed because everything I was good at, he wasn’t, and everything he was good at, I wasn’t. We had this kind of beautiful relationship of continuing to push ourselves and each other. GLENN HOLSTEN: What was he good at? ALISON MALMON: Brian was a really talented writer, he was extremely funny, he was kind of the history/English/journalism/poli-sci type of person. I was much better at sports, much more of a math mind. I was not nearly as funny, and not nearly as talented in writing. Academically, we both did very well in high school. He loved sports, but he was terrible at them. I was really good at them, so that was the one area where he always kept trying to improve, improve, improve, but he didn’t quite get there. GLENN HOLSTEN: Tell me about your life at home. ALISON MALMON: Our parents separated when I was eight and Brian was twelve. From that point on, we would kind of travel back and forth with each other between my parents’ houses. We were two peas in a pod. We always used to joke that we were like a married couple who had been married five years too long. He was my other half. That’s really the best way I could ever describe it. I looked up to him in certain ways, and also recognized that he looked up to me in certain ways. He was so creative, so funny, and just so talented. He was really pretty awesome. GLENN HOLSTEN: What college did he attend? ALISON MALMON: He got right into his top choice college, which for him was Columbia. We visited the city when he was probably fifteen or so, and I was eleven. We went there with our grandparents, and he was determined to own one of the tall buildings in New York at the time. He just really loved it there and had his heart set on living in New York City. At Columbia, he started writing for The Daily Spectator as a sports columnist. He had kind of a comical style. By the end of his senior year, he had become the sports editor of the paper in addition to being a columnist. His titled his column “Homerically Speaking,” which was entirely a riff off of The Simpsons (Brian was obsessed with The Simpsons), but he tried to pull it over everybody’s head as Homer, the talented philosopher and writer. In his columns, he made up a character named Uncle Ira, who was totally mythical, but he would write about Uncle Ira all the time. He also became president of his a capella group in addition to being kind of the soloist, and was a very popular kind of kid. GLENN HOLSTEN: He seems like a perfectly happy college student. When did his troubles start? ALISON MALMON: It was in his senior year that we learned that he had been struggling with his mental health since his freshman year. He took a leave of absence. He went to school counseling services at Columbia when he was showing signs of depression and anxiety. The therapist recommended that he come home for the weekend to relax. He came home, took a leave of absence, and at that point we really learned that he had been struggling for so long. My mom is a clinical social worker, and is very supportive. She got him into really intensive treatment through a variety of people in a variety of ways, but he ended up taking his life about a year and a half after that. GLENN HOLSTEN: Such a loss. I’m so sorry. ALISON MALMON: Thank you, thank you. GLENN HOLSTEN: He sounds like a very funny and a great guy. He had support at Columbia and support from home, but I guess it wasn’t enough. Tell me about the start of Active Minds and how it’s connected to this great loss in your life. ALISON MALMON: When Brian came home, I was a senior year in high school, I was seventeen, and I really understood very little about what was going on. Even though I come from a very supportive family and my mom’s a clinical social worker, there was never a conversation or education about mental health, or about depression, or about schizoaffective disorder, which was the best diagnosis we had for Brian. I went to Penn, and Brian was still at home. He died in March of my freshman year, and I was dumbstruck, dumbfounded by the fact that I had not heard the word schizoaffective disorder until Brian was diagnosed, and I had not really heard the word suicide until Brian died by suicide. There was just no conversation about this. I happened to be taking an abnormal psychology class the semester that Brian died. I already knew I was interested in psychology, and I had no idea what I wanted to do professionally. Here I was in Abnormal Psych, learning about all of these different mental illnesses, but never once did the professor say, “The age of onset of depression is actually exactly the high school and college age, and so many of you may be struggling with this right now, here’s where you can get help.” Instead, we were talking about the clinical symptoms and severity, and how we would diagnose our patients in the future. I had to kind of dig in and do my own research and I learned that, in fact, the age of onset of almost every mental health issue is exactly the high school and the college age. The fact that Brian was a very successful student and got into his top choice college and then started experiencing severe mental illness in his freshman year of college when he was eighteen is not atypical. It just blew me away that nobody had ever taught me that, and that we weren’t discussing it in my psych class. There was just no positive conversation about the issues. Brian saw his mental health diagnosis as somewhat of a life sentence. He thought that this was just how he was going to be and how he would live his whole life. There are, in fact, a ton of people — the majority of people — who are living successfully with a mental illness, but those stories were never getting out there. GLENN HOLSTEN: So what did you do with these different ideas? ALISON MALMON: After Brian died, in March of my freshman year, I started a student group at Penn to get students talking about mental health. I wanted to give my classmates the education and the words to use to appropriately talk about mental health and to share their stories, so that it becomes it’s less of a hush-hush issue. I want students to get the education that they need. I want them to learn about the signs and symptoms of different mental health issues that impact them and their friends, and then to identify the resources they need for getting help – to really create a culture and an environment where you feel comfortable seeking help. It’s not enough just to have the resources there, but people have to feel comfortable reaching out for it, knowing that it’s not just them, they’re not alone, knowing that there’s hope. Brian went from February of his freshman year until November of his senior year before he finally went and got help. I want people to get help or have friends reach out to other friends and help them get into the support they need as soon as they start struggling. That was really how Active Minds was born — out of my experience with Brian’s illness and death, and then also kind of my own reflection. We were so similar. Had I started experiencing depression and hearing voices in my freshman year, I don’t think that I would have told anybody. I would have also thought it was my own fault. I would have also struggled. Who knows what would have happened to me as well? That’s certainly and obviously the case for so many people, simply because we just don’t have the conversation out there for people to know that it’s okay to reach out for help. GLENN HOLSTEN: Right. 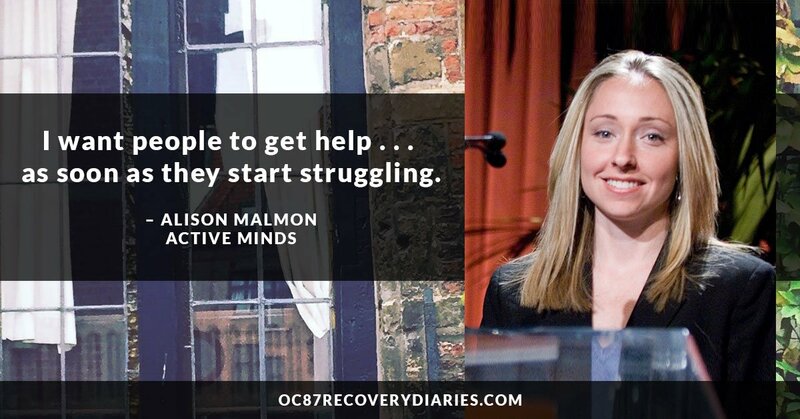 On our OC87 Recovery Diaries site, we share people’s testimonials of people living through recovery journeys. We hear a lot from college-age students. College-age women, especially, are writing and sharing their stories of struggle and recovery. We are hoping to include more men sharing as many kinds of experiences. I think there is a strength and power in seeing someone like you coming through the journey that you might be experiencing and knowing that someone is giving words to your inner thoughts, when you might have thought you were the only one having the thoughts. GLENN HOLSTEN: How is Active Minds structured? Is it really driven by students? ALISON MALMON: Yes. We were founded as a student group at Penn, and then after I graduated in 2003, I started a non-profit in order to develop and support other chapters of the student group on other campuses and really to create a national movement of young adults, students who are changing the conversation about mental health. We have a national headquarters in DC and a small staff of about fifteen. We have just over 400 chapters now, primarily in U.S.-based colleges and universities, but a handful of them are international, and a handful of them are in high schools. These chapters are all run by students who are volunteering their time to promote education awareness on their campus around mental health issues. We’re well known for our chapter network. We also have about ten to twelve programs that we roll out on a national level, both to support our chapters and to support the national conversation around young adult mental health. Everything from Awareness Day campaigns that our chapters and communities run to our Suicide Prevention Month, National Day Without Stigma, Eating Disorders Awareness Week; we have a week called Stress Less Week; we have a young adult mental health Speakers Bureau; we also have an Emerging Scholars Fellowship that gives stipends and mentorship to college students who are doing their own research in creative projects and mental health. A lot of our work is so driven by the students on their campuses. Our digital presence supports the conversation-changing that they’re doing on a more national level, and brings broader attention to the issue of young adult mental health and suicide prevention. We can all play a role to promote well-being for young adults. GLENN HOLSTEN: Alison, is this your life now? Is this taking up all your time? ALISON MALMON: Yeah, it’s been my full time job since the day I graduated! So we’re now 13 years old and I have been executive director ever since, and continue to build a team of incredible people who work at Active Minds. They really help lead us and move us, and I just get to be the one who’s talking to media and out there and being the face of the organization. I graduated from Penn with a psychology and sociology degree, double major. It really wasn’t until the end of my senior year that it occurred to me that this student group that I had been leading, Active Minds, could become a job. Fifteen years ago there was no work in psychology unless you went to graduate school, and so there was no natural career path, but when I was ending my senior year, I realized maybe I can just do this advocacy work as my work. I optioned a lot of opportunities and decided to start Active Minds as its own independent non-profit. I didn’t take a single business class at Wharton, I knew nothing about non-profit management, never worked in a non-profit, so it’s been a lot of on-the-job-training for me to lead the organization, but it certainly has been and is my life’s work. GLENN HOLSTEN: What is the work giving you? Does it give you hope? ALISON MALMON: For anybody who has survived suicide — or even anybody who’s gone through any loss or traumatic event — you go through this period of grieving in different ways. A couple of years after starting Active Minds, maybe four or five years after Brian’s death, I remember talking to my therapist at the time and saying, “If I were to do it again, I’m not sure that this is the best thing for my grief,” because I was at a place in my grief where I wasn’t necessarily thinking about Brian and the loss all the time, but I had to be because of the work that I was doing. I would say now that the organization is 13 years old, and that Brian has died 16 years ago, what it gives me is the ability to think and talk about Brian in a space where I would not have this opportunity if I was in any other job. There’s so many people that I know who have experienced loss, and even other losses I’ve experienced are private and they have to be private because there’s no natural space to share them, but I have the privilege of being able to tell people about him, and remember him, and to do it in a way that it’s not remembering him for how he died, but it’s remembering him for who he was. And the travesty, and the tragedy that occurred that caused him to feel like he was the only one and that there was no hope. On a very personal level, it gives me that space to continue my grief journey, and at this point being 16 years out, that grief journey is all about remembering him and remembering all the great things. Plus, I get to hear the testimonials and meet these students and individuals who credit Active Minds for saving their lives, changing their lives, and changing their career trajectory. Even seeing the staff at Active Minds and realizing that we’ve created a place for people to have a full-time job in advocacy around young adult mental health. We’ve really created a new career path for this generation. There are no words to describe it. It’s absolutely amazing. It’s amazing to see all these individuals here, and to wonder what would have happened to them had we not been here. You put the two of those things together and you really can’t beat it. Certainly I’m also, in some ways, an entrepreneur, so I certainly deal with the everyday stresses and stressors of leading an organization and being an executive director, but there’s no topic or group of people I would ever rather work with, and so you just deal with it. You get through it because of the incredible impact that you have. GLENN HOLSTEN: From our little corner of the world, I do see you having an impact. We work with people who are writing about mental health at the college age. They have a vocabulary to describe their lived experience and aren’t shy about sharing their journeys, so I think you’re making a big difference. I’m really grateful for the work you and your colleagues do. ALISON MALMON: I appreciate that. In the US we can talk about cancer, asthma, heart disease without worry of recrimination. Can the same be said for talking about a mental illness diagnosis?